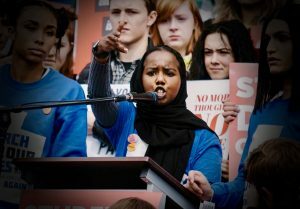 Saida Dahir is only 17, but after she read her poem to 8,000 people at the #MarchForOurLives rally in Salt Lake City she became a leader of a movement. She is incredibly smart, kind, and well spoken. See for yourself! This entry was posted in Podcast Episodes and tagged Bill Allred, Dylan Allred, Gen Y, Guns, MarchForOurLives, Muslim, Poetry, Politics, Refugee, Saida Dahir, Salt Lake City, The Let's Go Eat Show. Bookmark the permalink. Saida is a delight. She, and others of her generation, give me so much hope for the future. I’m proud to be a mother of this generation of children coming forward to change the world.